Through the OSC eBuy Cooperative Purchasing Portal users can easily search for OSC awarded products, price compare and take advantage of customized workflow & approval routes. If you’re interested in additional functionality, the OSC Sponsored Marketplace allows for financial integration with MUNIS, State Software (USAS) and more! Learn more about the OSC eBuy Cooperative Purchasing Portal during an upcoming webinar or hands-on training session. Now you can purchase locally bid items through the OSC eBuy Cooperative Purchasing Portal. 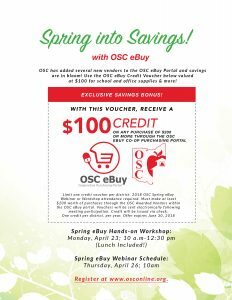 Not sure how to use OSC eBuy? View the OSC eBuy Marketplace Instructions or check out the video tutorial below! OSC eBuy Cooperative Purchasing Portal: Demo Video from Ohio Schools Council on Vimeo. tperkins@osconline.org or (216) 447-3100 x 6103 to learn more.